Posted in: Fruit, Leaves, nature, outdoors, Photography, Plants, Trees. Tagged: beauitul, fig, fresh, geen, Nature, outdoors, photo, Photography, picture, plants, rain, Wildlife. We a rain shower this early this morning. It freshened everything up for the rest of the day. When I went outside rain droplets were still hanging from many tree leaves and some fruit. 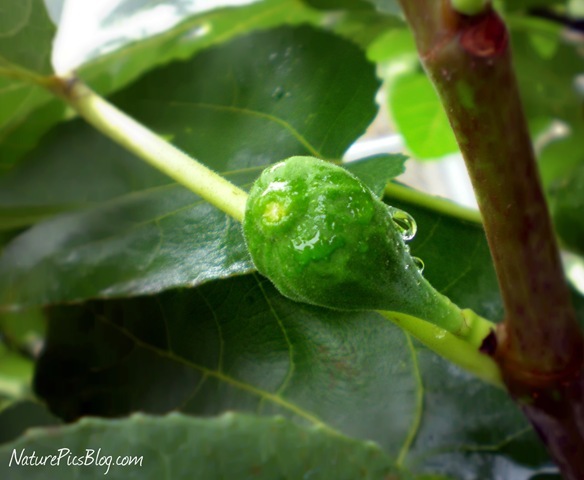 I thought the droplets made this fig look so fresh.